LISTEN NOW! Greg, John, and Pat share about Reverend Bill Graham’s last crusade “My Hope America” and the longevity of his life and ministry. 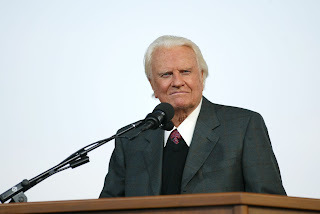 They discuss how this will be Reverend Billy Graham’s last crusade and his efforts to include other ministers and musicians as a part of his crusade. One of those musicians is Christian rapper Lecrae. Lecrae had some interesting things to say about Reverend Billy Graham’s longevity of ministry and the world influence in the face of his unswerving stand for truth that would be offensive to some. They continue to discuss how no man can have that type of favor unless God gives it to him. They continued to share that there is going to be a mantle that is going to be released for that same favor as God will not leave himself without a witness and there will be a great harvest of souls.